If the amazing longevity of the forerunner of this series (‘Landmarks’) is anything to go by (produced in 1992 it’s still being used in primary schools throughout the country ...), this refreshingly new series (which we’ve previewed) will enjoy a deservedly long shelf life. • Aztecs priests, gods and rituals. • What happened to the Aztecs after the conquest. My 5A class was wondering why the monkey is always pictured wearing an earring? Also 5H wanted to know your opinion on who was sacrificed after the ball game--the winners or the losers? Mexicolore replies: We’ve answered 5A’s excellent question in our ‘Ask Us’ section (‘The monkey’s earring’). 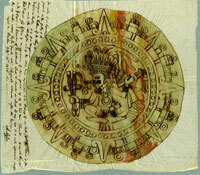 5H’s question is also a good one, but it’s a very difficult one to answer: the key to this is to remember that the ritual ballgame is over 3,500 years old and was played all over ancient Mesoamerica; this means that the rules changed constantly from region to region, people to people, and era to era. Some sources suggest winners were sacrificed, some point to losers being sacrificed, and some indicate that no-one was sacrificed. Where sacrifice was involved it was often a team captain rather than the entire team. Generally, human sacrifice WAS associated with the ballgame, because it was believed to be a great honour to be sacrificed to the gods (who had first played the ballgame, according to ancient myth). Another question, this time from Matt G. and Cody C.: Would the Aztecs use (in religious ceremonies) the heart and blood of people who died of natural causes? I think the boys want to make sure that dead bodies didn’t go to waste! P.S. We LOVE your site and thank you for the quick feedback. Mexicolore replies: No. The gods deserved ‘the best’, and thus were only offered the hearts of (generally strong, young, vigorous) warriors, normally those captured in battles with neighbouring tribes. Warriors who died in human sacrifice or in battle went to join the Sun God in one of the highest ‘heavens’. Those who died natural deaths generally went ‘down’ to the final resting place in the underworld called Mictlan. Madison D. in my 5th grade World Languages class was wondering if children were ever sacrificed? And, Holly P. wanted to know if the priests were ever sacrificed? Thanks from Perry Elementary 5H, Shoemakersville, PA, USA. Can you buy or download the series online? Is it possible to buy this dvd. I have tried, but i could not find it any where on the internet. Can you help?.